One leather. Two leather. Black leather. Grey leather. 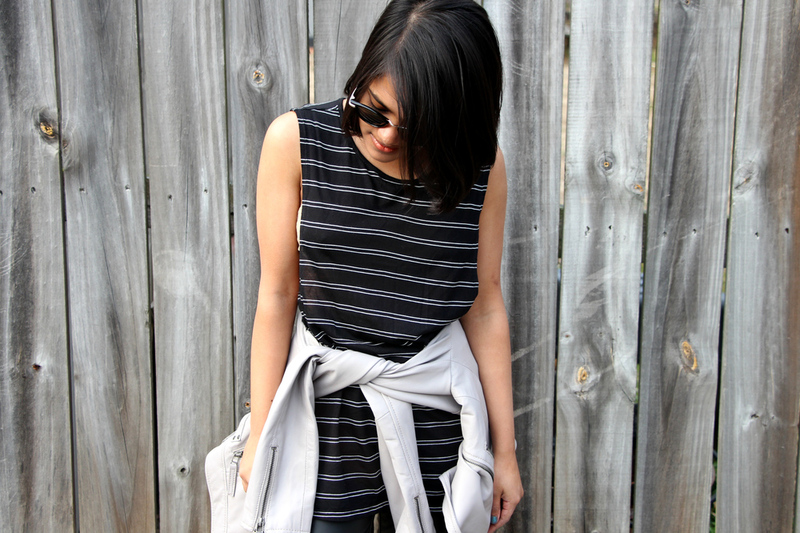 Black leather jackets are edgy, classic, and amazing, but grey. Grey leather jacket just takes the cake. Don't doubt it. Just do it. You won't regret it. Every time I look in my closet and see this jacket hanging there, I feel at peace knowing that I will always be a little cooler owning it. This Dorothy Perkins jacket fits better than my other leather jackets and the sleeves aren't as long either. Don't let Christian Grey steer you way from this color because it make you look fifty shades better. I styled up this piece with a slightly long black and white muscle tank and black liquid leggings for a minimalistic look. Black is the background color to make the lighter colors, white and grey, pop. Liquid leggings sound so weird but they're almost like a leather skin. They're amazing if you have short legs like me and want the illusion of long legs. You can also tie your jacket around your waist for the "Yes, only the coolest of the grunge people wear their leather jackets like a flannel shirt" look. It's a simple look that takes more confidence to wear, but it does wonders when you wear it in public. Almost like...you could conquer the world with the biker gang you suddenly became the leader of. Grey can seem mundane, but sometimes it can be the pop of color you need. In a sea of black leather, be the one wearing grey, if the world happens to be full of minimalistic badasses. This was one of my favorite photo shoots to do: Thanks Nisha! !